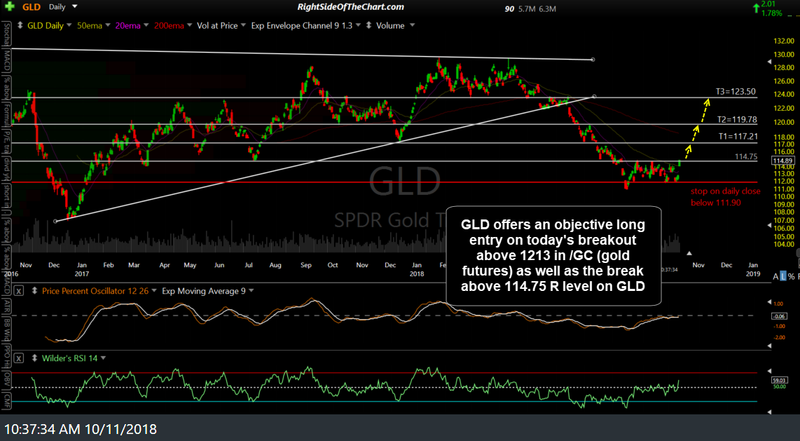 GLD (gold ETF) will be added as an Active Long Swing Trade as well as a Long-term Trade Idea here around the 114.89 level. The price targets are T1 at 117.21, T2 at 119.78 & T3 at 123.50, with the potential for additional price targets, depending on how the charts develop going forward. The maximum suggested stop (of targeting T2 and/or T3) is a daily close below 111.90. The suggested beta-adjusted position size is 1.2. 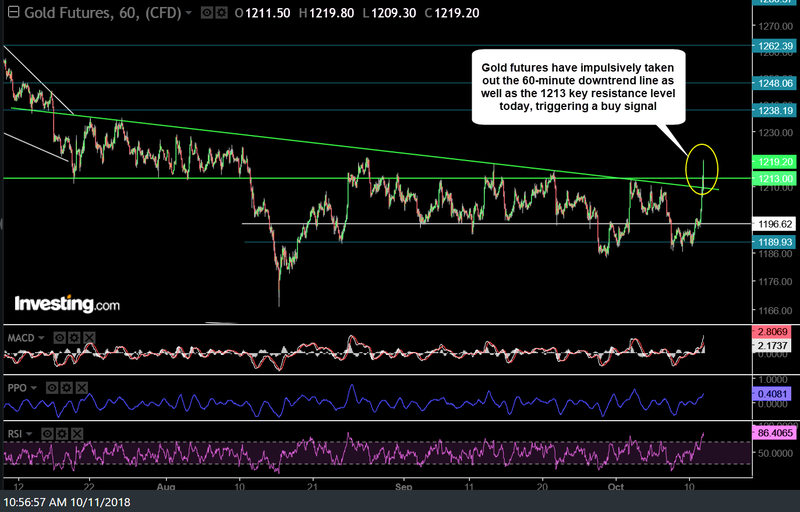 One of the primary reasons for the long entry today is the fact that /GC (gold futures) have made a fairly impulsive breakout above downtrend line as well as the key 1213 resistance level on the 60-minute time frame. I have also highlighted some recent bullish developments that I had been looking for in the EUR/USD currency pair, with those developments as well as an update on gold & GDX covered in this video published earlier today. Another consideration for a long in gold is my focus on tactical asset allocation as we head into what I expect to be a volatile 4th quarter in the stock market as gold has traditionally been considered a safe haven asset during times of market volatility. While the success or failure of the already active GDX & PPLT long trades and this long on GLD are closely tied together (and as such, the very tight correlation should be factored in when determining one’s position size & total exposure to the precious metals & miners), one final factor in adding gold as an official trade is the fact that while GDX will usually outperform gold both to the upside during bull trends & to the downside durning bear trends, as equities (companies with expenses, employees, profits & losses, etc.) I have seen periods where gold rallies & the gold mining stocks lag behind or even move lower due to blanket selling in the stock market. Randy, so glad I found you a couple of weeks ago. I’ve been watching GDX for a couple of months now after what looked like a selling climax, by some measures the sentiment in gold is at the levels of the 2016 bottom. I got out of VXX and QID yesterday, I’m not active enough to trade intradays, more swing trade. I believe we could follow the 1999-2000 Nasdaq analog which had a zig zag correction in January, the made a top in March, the the first leg down retraced the whole level and broke support then bear flagged rallied into the fall. There are a lot of excesses built up in this market. I don’t think I can trade long stock markets until we get a good daily reversal stick, then again that may be just a too short a rally to take advantage of, AAPL has barely corrected. Thanks for the great analysis!!! Welcome! I agree. Anyone that’s not an active trader might now want to force any new long equity trades at this point in the market based on the technicals as well as an economic cycle likely in the late to very late stage. As there is a decent chance that we could be looking at a market top vs. just another correction with an ongoing bull with plenty of room to run, that makes individual stock picking & rotating from the most bearish sectors to the bullish sectors as you might during a corrective phase within a bull market much more difficult as bear markets usually bring them all down, defensive sectors like utilities & staples, along with it. There are always a few gems that buck the overall trend & if I find any, I’ll post them but I would suspect the majority of individual stock trade ideas for the foreseeable future will be shorts other than relatively short-term bounce trades. Today’s price action in gold & the miners looking about as good as gets but the more we put those breakout levels in the rear-view mirror, the better the case for a lasting rally. More so, I’d really like to see the case for a significant top in the $USD firmed up as well. Great question but the quick answer is there is no “single” easy way to gauge where we are in the economic cycle with any useful degree of certainty. There are so many factors & variables to look at & if things weren’t so busy lately, I would be more than glad to take the time to write as many down as I can think of off hand. With that being said, maybe I can put together a video covering some of the more common charts & economic indicators as well as some other things that I might use to gauge where we are in the business cycle. Thanks…I knew there would be no easy answer. Down the road a video would be great.